Brides and grooms looking for that extra wow factor at their wedding are finding it by having a Hog Roast Feast and Barbeque. The English summer pastime of barbeques has been turned into a mouth watering wedding feast that is a great topic and remembered by guests for a long time. A whole roast pig or lamb turning on a spit with a vast selection of sausages, steak, chicken, fish and vegetables laid out will produce some great mouth watering aromas for you and your wedding guests. There are two ways you can choose when having a hog roast for your wedding. The first choice is to book it and leave it to the professionals or you can hire the equipment and do it yourselves. Everything will be set up, served and cleared away without you having to lift a finger. It leaves you more time to spend with your guests, relax and have no worries. If your venue does not have facilities for food or even a kitchen then a hog roast could be the ideal solution to feeding your guests. Most companies that offer the hog roast come fully equipped with their own mobile facilities as well as fully qualified staff. All meat is cooked fresh at your venue. A catering team trained in health and hygiene standards. More expensive but it will give you peace of mind. The downfall of doing it yourself is you will have to buy the food and set it up yourself. Designate a reliable person to ensure safety is adhered to at all times. Have somebody on hand to cook, cut and serve the meats. Large hogs can take up to six hours to cook to perfection and this will take up a lot of somebody's time. Although a cheaper option it is most time consuming. Roast meats from beef, lamb, turkey, pig or gammon can be accompanied with crispy crackling and stuffing. To go with the succulent meat there is such a wide choice of salads and potato dishes, vegetables, pasta and crusty bread. If you have a professional company doing it all for you they will also supply desserts and coffees to round up your wonderful hog roast. Vegetarians are not forgotten at your hog roast as dishes such as quiches, stuffed peppers, goats cheese tarts and nut cutlets to mention a few are available. For the smaller wedding or just for something extra to feed your guests during the evening reception you can have a hog roast that consists of baguettes filled with slices of pork, stuffing and apple sauce. With costs averaging £6.50 per person this can be perfect for late weddings and ideal for evening guests. 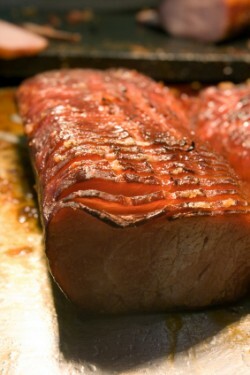 Like all menus on offer the cost of a roast hog will depend on what you want to serve your guests and how many courses. 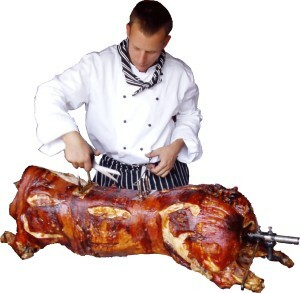 By choosing a hog roast you are giving yourself a much wider selection in where to get married. The whole operation can be set up in an open field, under a gazebo, a barn, a garage or even your garden. Hotels and large country houses are now beginning to realise how popular hog roasts are becoming at weddings and to this end most of them now have their own equipment and staff on hand to help you choose your dishes. Hog roasts can be done at any time of the day, from sunset to sunrise this type of food will not be out of place no matter when it's eaten. You can almost guarantee that your guests will not still be picking at the buffet table two hours after they have eaten once they have eaten and enjoyed their fill of mouth-watering roasted and barbecued meats and/or fishes. * The prices mentioned above are as of 2009, and maybe subject to change.